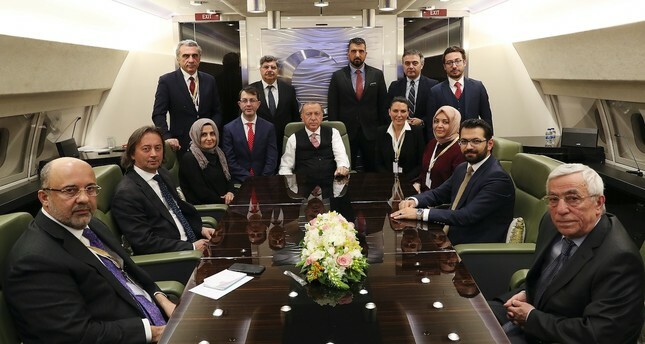 President Recep Tayyip Erdoğan accompanied by journalists on the presidential plane returning from Russia, April 9, 2019. The purchase of the Russian-made S-400 defense systems is a decision made against external security threats, President Recep Tayyip Erdoğan said Tuesday, adding that the step taken for Turkey's national security does not target a third country nor does it authorize a third country to have a say in Ankara's sovereign choices. "Turkey, with its state and nation, is an absolute sovereign state and we will not share this with anyone," Erdoğan told journalists accompanying him during his visit to Moscow, where he attended the opening ceremony of the Turkey-Russia cross-cultural year and held bilateral talks with Russian President Vladimir Putin during the Turkish-Russian High-Level Cooperation Council meetings on Monday. Erdoğan said there is great international interest in Turkey's S-400 decision and that Turkish ministers are frequently being asked whether there has been a change in Ankara's position on the S-400s. "We tell them 'this is a job completed, all is ready.' The delivery of the S-400 missile defense system was supposed to be in July, it may be done earlier," the president said. The Ankara-Moscow S-400 deal was inked in December 2017, when the parties signed a $2.5 billion agreement for two batteries of the system, Russia's most advanced long-range anti-aircraft missile system. Turkey will be the first NATO member country to acquire the system. Moreover, Turkey seeks to build its own missile defense systems as the deal also involves the transfer of know-how and technology. He said that while Ankara and Washington are not on the same page, NATO sees the matter as Turkey's sovereign decision. Erdoğan responded to the U.S. questioning of the joint production and availability of related technology by saying all the articles have been inked in the deal in detail. "We are here as one of the strongest military powers of NATO. When such criticism is being made, how come nobody mentions this side of Turkey? I mean, why shouldn't one of NATO's strongest militaries have a strong air defense systems?" Erdoğan asked. He added that despite Turkey's requests for defense support its demands were not responded to positively, leading to Ankara finding its own alternatives. Turkey has remained unfazed in the face of threats from the U.S., with many officials repeatedly stressing that the S-400 deal is not a threat to NATO systems and is not on the table to be used as a bargaining chip against the F-35 jets and Patriot missile negotiations. Washington's criticism had taken a sharp leap when U.S. Vice President Mike Pence had said on April 3 that Turkey's decision on the S-400s put at risk the NATO alliance. "Turkey must choose. Does it want to remain a critical partner in the most successful military alliance in history or does it want to risk the security of that partnership by making such reckless decisions that undermine our alliance?" Pence said in remarks at a NATO event in Washington. "The United States must choose. Does it want to remain Turkey's ally or risk our friendship by joining forces with terrorists to undermine its NATO ally's defense against its enemies?" Turkish Vice President Fuat Oktay responded to Pence on his official Twitter account. Erdoğan also commented on Pence's remarks, "Pence's remarks are non-binding. NATO General-Secretary Jens Stoltenberg's remarks were. NATO's general-secretary is not Pence. Stoltenberg had already said the last word with his remarks and he did that a few times." Erdoğan accused Washington of having double standards against Turkey's S-400 decision, saying that countries such as Greece, Bulgaria and Slovakia also have similar systems. He underlined that Turkey's need for an air defense system had to be met and a decision to purchase the S-400 systems was made following the lack of cooperation from the U.S. The president added that Turkey was open to purchasing the U.S. Patriot systems as well, if similar conditions were made available. Ankara's decision to resort to the Russian-made surface-to-air (SAM) S-400 system is the result of a comprehensive calculation of geopolitical risks compelling the country to look for alternatives to strengthen its defense systems after the U.S. refused to sell similar weapons to Turkey. When Turkey wanted to the buy the Patriot missile system from the U.S. in 2009 during then-President Barack Obama's term, the U.S. Congress declined the offer for the sale of the Patriot PAC-3 batteries, worth $7.8 billion at the time. When it comes to Syria, Erdoğan said that the conversations with Russia mostly revolved around the situation in Idlib. "In this respect, Russia's main problem is regarding the presence of some terrorist organizations in the region," Erdoğan said, adding that Turkish military and intelligence services have been warning Russian troops when it is necessary in the region. "Still," Erdoğan added, "we have been continuing our fight against terrorist organizations within the same region." The Sochi agreement was reached on Sept. 17 by President Recep Tayyip Erdoğan and his Russian counterpart Vladimir Putin. According to the agreement, the cease-fire in the Idlib region will be preserved, with the withdrawal of heavy arms and radicals from the region. Prior to the agreement, the Bashar Assad regime was signaling a grand operation in Idlib, which is the last stronghold of the opposition, sparking deep fears in the international community of a new humanitarian crisis. As Turkey and Russia stepped in and averted a possible disaster, the Sochi deal was internationally welcomed. Expressing that there are still some who claim that the People's Protection Units (YPG) are not a terrorist organization, Erdoğan said that the YPG is the affiliate of the PKK and there is no way of proving otherwise. He also criticized the U.S.' stance regarding the issue, saying that the country tried to defame Turkey by trying to create the illusion of Ankara having something against the Kurds by equating the Kurds with YPG terrorists. "We have no problem with the Kurds. Our problem is with the terrorist organizations," the president underlined. The close U.S. partnership with the YPG since former President Barack Obama's administration has always been a sticking point in Washington-Ankara relations. Turkey sees the YPG as an extension of the PKK, which has claimed the lives of more than 40,000 people. The U.S., however, while listing the PKK as a terrorist group, is maintaining its steadfast militarily support for the terrorist organization by providing truckloads of military supplies and military training, under the pretext of fighting Daesh. As far as the safe zone that is planned to be formed in northern Syria is concerned, Erdoğan said that Turkey has been insisting on having control over the area. Ankara has repeatedly expressed to Washington that it was necessary to establish a safe zone along Turkey's borders that would be free of terrorists. Recently, the U.S. finally showed interest in creating a safe zone, starting talks with Ankara. As Turkey's and Washington's understandings of the safe zone differ, concrete steps are yet to be taken. "Yet, more important than anything, we have our sensitivities regarding the territorial integrity of Syria and we will continue to have these sensitivities till the end," the president emphasized. When he was asked whether or not there is some kind of a disagreement with Russia over who should be involved in a new constitutional committee with Syria, Erdoğan said that there was disagreement over six names but now they have reached a solution over them. Erdoğan also expressed that the quartet summit between Turkey, Russia, France and Germany over Syria that was held in Istanbul can be repeated in the near future as French President Emmanuel Macron recently called with such a demand. "Putin also welcomes the idea [of having yet another quartet summit]," the president said, adding that still there must be some improvement in the formation of a new constitutional committee for Syria in order for such a summit to be held once again. Erdoğan also said: "There might be further steps in the future to strengthen the Astana process even more." He said that Jordan, Iraq, Lebanon, Germany and even China, as was mentioned by Russia, can be involved in the process. "This way the decisions that are reached there [in the Astana process] can be more powerful in Geneva and internationally," he said. The quartet summit, which was first held in Istanbul with the participation of Turkish, Russian, French and German leaders on Oct. 27, drew great international attention as it was the first time that the four leaders met to address the ongoing crisis in Syria. In a joint statement following the first summit, the four leaders expressed their determination to reject separatist agendas aiming to undermine the sovereignty and territorial integrity of Syria and that it was crucial to reach a comprehensive cease-fire in Idlib as well. It also emphasized that efforts will be accelerated for the political process, stressing that free and fair elections should be held for the Syrian people to decide on their future. The local elections and the period in the aftermath of the elections have become another prominent topic of interviews as the president expressed the Justice and Development Party's (AK Party) determination to seek its rights through legal means. "If in a city like Istanbul, where there are almost 11 million voters, there is a difference as small as 30,000 between the votes, and if this number decreases to 13,000 quickly only through objections, then we have to pursue our struggle," Erdoğan said, referring to the AK Party's ongoing objections to the election. "Even if only one vote is the problem, the YSK [Supreme Election Council] is the one who has the ultimate decision," Erdoğan underlined, adding that whatever the YSK decides, everyone has to respect that. On March 31, millions of Turkish voters cast votes in the local elections to choose Turkey's mayors, city council members, mukhtars (neighborhood officials) and members of elder councils for the next five years. An appeal and objection process followed election day as many parties were determined to exhaust all appeals and move the election results to the YSK in certain electoral districts. While in many provinces election results have already been declared, in Istanbul, which saw a tight race, the case is not the same. There have been reports of irregularities and unregistered votes by the parties. Giving examples from his political career, Erdoğan said that back in 1991, when he was elected as a deputy and received his mandate, his position was taken away from him as a result of a decision of the YSK following an objection. "I had to accept that decision," Erdoğan said, indicating that AK Party cannot overlook the current expectations from the people for the clarification of the election and that's why the objections are a must. "We have to remove all the suspicions," the president said. Referring to examples around the world over on recounting of votes, Erdoğan said that when Turkey goes through a similar process, some have difficulty in accepting that. There are examples of recounts in the U.S. In 2000, following the presidential elections that took place between George W. Bush and Al Gore, it was revealed that the vote difference between the two candidates was quite small in the state of Florida, with Al Gore in the lead. After the votes were recounted, Bush received 2,912,790 of the votes, winning the election against Gore, who received 2,912,253. A similar case took place in Florida once again in 2018 during the Senate elections, where the votes were recounted twice in two weeks. The 2016 presidential elections witnessed recounting incidents more than once. One of them took place in the state of Nevada, while others took place in Michigan and Wisconsin, where the votes were recounted on the objection of the Democrat candidate Hillary Clinton. As a result, in Wisconsin, Clinton's rival Donald Trump increased his number of votes. Another example of recounting took place in Austria during the 2016 presidential elections as the votes were reassessed with the claims that there were some "major irregularities." Similarly, during the 2009 presidential elections in Romania, votes were recounted as a result of objections by the country's Social Democrat Party. In response to a question of whether there was some laxness among the AK Party's polling clerks, Erdoğan said that the AK Party's local branches had taken the ballot boxes under full control. However, the president said, although the heads of the polling clerks were supposed to be public officials, in some places there is evidence that even some military officials have taken the post, which raises suspicions. "This situation might even lead to the cancellation of the elections [in Istanbul]," Erdoğan expressed. Regarding the suspicious situation in Istanbul's Büyükçekmece district, Erdoğan said that evidence shows the relocation of some voters to empty buildings in the district as if they were resident there, proves that there are some irregularities within the elections. He added that there are some rumors that similar things also took place in other districts of the province as well. The president also criticized the head of the main opposition Republican People's Party (CHP) for his lack of comprehension of the process as well as a lack of information about the authority and responsibilities of a president. Erdoğan underlined that in the election-free period that lies ahead, the government will take steps in bilateral political, military, economic, trade and cultural areas. Turkey held local elections on March 31 and there are currently no elections scheduled until 2023. The president said that bilateral diplomatic visits, Turkey's fight against terror, investment and economic steps will continue without compromise. He added, however, that investment in the economy is the government's key priority for the short-term period. "Investment has to take place for employment and production. This way, we will reach the levels of excitement reached 15-16 years ago," Erdoğan said, adding that with ongoing investments, 2019 will be a dynamic year, particularly in the tourism sector. Erdoğan also commented on recent regional developments, the U.S. recognition of Syria's Golan Heights as Israeli territory and the reciprocal steps between Tehran and Washington on declaring each other's militaries as terrorists. in Netanyahu visited the U.S. President Donald Trump last month. At their March 25 meeting, Trump signed a proclamation officially granting U.S. recognition of the Golan as Israeli territory, a dramatic departure from decades of U.S. policy. Israel captured the Golan Heights in the 1967 Middle East war and annexed it in 1981 in a move not recognized internationally. The president also added that Israel's annexation of West Bank is not an acceptable matter and that Turkey will continue to stand against the decision. He added that the Organisation of Islamic Cooperation (OIC) has also expressed opposition to Israeli decision, which is also shared by the EU, Russia and China as well. Netanyahu pledged on Saturday to annex Jewish settlements in the occupied West Bank if re-elected, in a bid to mobilize his nationalist base in the final stretch of the tight race.